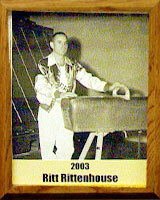 Preston “Ritt” Rittenhouse attended Catalina Junior High where he was the school’s first all-city athlete in baseball. He went to Tucson High School from 1944-47 where he lettered in baseball. He was a member of the 1945-46 squad that is often referred to as the “Best Ever in Arizona.” While at Tucson High he also played American Legion Baseball at Morgan McDermot Post #7 where his team was sectional champion several times and ranked fourth in the nation. He also was the AAU trampoline champion for the state of Arizona in 1948. As a student at the University of Arizona, he participated in baseball and swimming. In 1951 he was the Border Conference diving champion. From 1958 to 1969 he coached the Catalina High School boys gymnastics team that won city championships six times and state titles four times. Preston continued to teach in the Tucson Unified School District until 1987. Besides being a teacher and coach, “Ritt” also challenged himself physically by climbing Mt. Fuji (1959); the Matterhorn (1963); Mt. Whitney (1966; did a 15-day canoe trip of Hudson Bay (1975); completed a 4250-mile bicentennial bike ride across the U.S. (1976); did an eight-day raft trip of the Grand Canyon (1980); rode the El Tour de Tucson (1983-85); kayaked 10 days on the Rio Usamacinto in Guatemala (1994); paraglided in New Zealand (1998); took a 7,000-foot free skydive at 120 m.p.h. (2001) and did a 1001-mile solo bike ride from Daytona, Fl., to Doylestown, Pa. He has bicycled over 68,200 miles in over 15 foreign countries so far. And he is still riding!